Friedrich Nietzsche was a German philosopher who knew how to use a pen. Nietzsche's fame came after his death. What did Nietzsche philosophize about? In a nutshell, Friedrich Nietzsche's specialty was to analyze the background and the values of Western society. 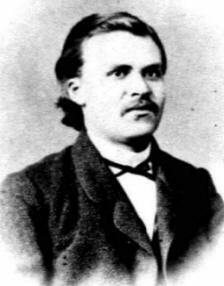 Friedrich Nietzsche's father was Carl Ludwig Nietzsche, a minister. He died when Friedrich was four years old. Friedrich had a younger sister, Elisabeth. In 1864, Friedrich first studied at the University of Bonn, then at the University of Leipzig. In 1867, he served in the military. He had troubles with his horse and thanks to the resulting injury, Friedrich Nietzsche could get back to his studies in 1868. In 1869, Nietzsche was professor of classical philology (linguistics) at the University of Basel, Switzerland. In the Franco-Prussian War, which was fought 1870-1871, Nietzsche helped out in the army hospital where he contracted diphtheria. In 1879, Nietzsche had to quit his job because of his health. From 1889 until his death, Nietzsche was mentally not there anymore. Some people believe he contracted syphilis. Friedrich Nietzsche was also composer of a few songs. Two people had a big influence on Friedrich Nietzsche, the philosopher Arthur Schopenhauer and the composer Richard Wagner. Nietzsche's greedy sister Elisabeth was quite the character. She was in favor of Adolf Hitler and in this context many people started to believe that Friedrich too was a supporter, when in fact he was against Hitler's ideas.